(Left) Prime Minister Narendra Modi being presented a bow and an arrow during a rally in Tamil Nadu’s Ramanathapuram; Congress president Rahul Gandhi with party general secretary Priyanka Gandhi Vadra during a roadshow after filing his nomination papers for Lok Sabha elections in Wayanad. One expected that with Congress president Rahul Gandhi filing his nomination from Wayanad in Kerala, there would be sufficient curiosity about southern Indian states, but that doesn’t seem to be the case. There may be a slight academic interest, but if you confuse that for genuine enthusiasm, and start reeling out ethnographic details of the state, disinterest becomes palpable. Or they come up with fatuous questions, like what I was asked the other day in a lounge in Lutyens’ Delhi: “What’s the difference between Kerala communists and Bengal communists?" I replied: “Kerala communists are fighting, Bengal communists have retired." Then, if they learn you are from Karnataka, they make an obnoxious enquiry sound like a truism: “Does H. D. Deve Gowda (former prime minister, and former chief minister of Karnataka) still doze off on the dais?" What they don’t realize is that if Gowda had slept through his six decades in politics, he wouldn’t be fighting an election today from Tumkur for the first time at the age of 85; he wouldn’t be in a position to make his son chief minister by winning only 37 of 224 seats in the 2018 assembly polls; in the same election, he wouldn’t have been able to defeat an incumbent chief minister, Siddaramaiah, in his home turf; and ensure that every big opposition leader attended his son’s swearing-in ceremony. All this requires some political capital and deft manoeuvring. The obsession with Uttar Pradesh is understandable. The state has 80 seats, Prime Minister Narendra Modi is contesting from there, many past prime ministers have come from there, the Congress president and United Progressive Alliance (UPA) chairperson are from there, and there is the sacred antiquity of Kashi and Ayodhya in the Hindu mind. A big chunk of seats for the BJP from here, like in 2014, may perfect a second term. All of this is true, but how fair is it to ignore the south’s 130 Lok Sabha seats? In 2004 and 2009, when UPA came to power it was not Uttar Pradesh that gave the surprise lift to the Congress-led coalition, it was the south. In fact, it was chiefly Andhra Pradesh, with 29 and 33 seats respectively for the Congress, followed by Tamil Nadu where the Dravida Munnetra Kazhagam (DMK)-led UPA alliance swept the entire 39 seats in 2004, and 27 in 2009. And now again, the bifurcated Telugu state of Telangana and Andhra Pradesh, plus Tamil Nadu are poised to play a lead role in any regime that will be propped up in Delhi after 23 May. Even when Atal Bihari Vajpayee stabilized his coalition in 1999 to rule a full term, Uttar Pradesh gave the BJP only 29 seats, but the biggest National Democratic Alliance (NDA) ally was Chandrababu Naidu’s Telugu Desam Party (TDP) with 29 seats. DMK, too, switched to NDA with 26 seats. K. Chandrashekar Rao (KCR), Telangana Rashtra Samithi chief and chief minister of Telangana, has consistently spoken of a non-Congress, non-BJP federal front, and he has a formal understanding with the YSR Congress Party’s (YSRCP’s) Y.S. Jagan Mohan Reddy in Andhra Pradesh. Interestingly, Gowda, who is with the UPA, has a more than tactical relationship with KCR. West Bengal chief minister Mamata Banerjee, too, has played along with the idea of a federal front. Besides, there is some kind of a south-eastern block shaping up, with Odisha chief minister Naveen Patnaik’s Biju Janata Dal getting spoken about in political circles along with the TRS and the YSRCP as a group that is expected to control close to 45-50 seats. “Just watch, this block will control everything in Delhi," a person close to the TRS first family told me. 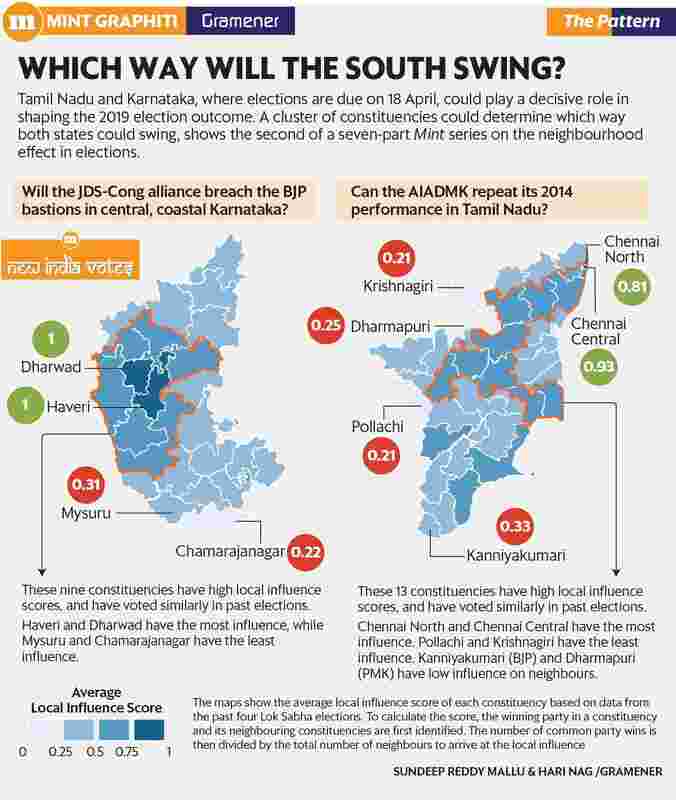 Despite this enveloping scenario, the disinterest in the south, perhaps, is also because the BJP which sports the power halo, has no real opportunity to harvest seats there, except for in Karnataka. And in Karnataka too, it is not entirely bred on the idea of Hindutva, but rests primarily on caste identity, crafted by Lingayat leader former Karnataka chief minister B.S. Yeddyurappa, since 2008. This gives Modi only a secondary role in their only strongest southern state, and not the primacy he enjoys in the Hindi belt. In fact, during the 2018 assembly polls, Congress candidates who were “named and shamed" by Modi in his rallies in Bengaluru won with handsome leads. In North Karnataka where the BJP did well, the Lingayats were decisive, and for the record, they had walked into the BJP before Modi rose to the helm. It is not that the BJP has not tried to introduce Hindutva or narrow nationalism. They have fanned the Hubli Idgah Maidan issue, attacked minorities in the coast, staked claim to the syncretic shrine in Baba Budan hills, and have introduced young sophists like Pratap Simha and Tejasvi Surya, but none of this can define BJP’s electoral success in Karnataka. More than Hindutva, nationalism has had a better draw in the south, but in a region geographically removed from harsh realities of wars in the 1960s or 70s, nothing can be overdone. The tragedy of Pulwama or the operation at Balakot does not surge in Modi’s rallies in the south as much as it does in the north. In Tamil Nadu, the BJP may be in an eight-party alliance led by All India Anna Dravida Munnetra Kazhagam, which is contesting 20 seats and has offered five to the saffron party, but there is very little traction on the ground for this arrangement. Similarly, in Telangana, Andhra Pradesh and Kerala they are not exactly in the reckoning. In 2014, the BJP got three seats in the Telugu region, and is yet to open an account in Kerala. In Tamil Nadu they got one seat in 2014, and their best ever performance was in 1999 when they got four seats. In 2009, even when they contested 18 seats, they scored a naught. Why is the south a bit of a conundrum for the BJP, and for an ordinary voter across the north? The biggest reason for this is the nature of the south’s diversity. When we say diversity, it is not linguistic diversity alone. In the last couple of decades there is an increasing realization in the southern states that there is far greater cultural incongruence within the states relating to world view, dialects, choice of grains, spices, clothes, sharing of river water, etc., than an imagined bind called language. This incongruence has led to demands for the different cultural zones to become separate states. The first casualty of such a dissonance was the Telugu country, which was bifurcated into two, in 2014. In Karnataka, the demand for separate states from within rent the air at regular intervals. Interestingly, during this election we have seen this play out subtly in Karnataka. Gowda is contesting from Tumkur, but he is originally from Hassan. Apparently, in the past, Gowda had refused to share the Hemavathi river water, a tributary of Cauvery, that irrigates most of Hassan with Tumkur district. Now, that alleged obstinacy of Gowda is being held against him. “The curse of Ganga is on him," one local BJP leader said. Similarly, Sadanand Gowda and Veerappa Moily, Tulu speakers from the coast of Karnataka have never fully blended with the cultural ethos of their constituencies in the semi-arid plains, leading to a quiet distrust. The gods too have not worked out for the BJP in the south. Lord Ram of the north is not exactly the Lord Rama of the south, the versions of the epics in the Dravidian context have unseen twists. Therefore, a leader like DMK’s M. Karunanidhi could ask a few years ago: “Which engineering college did Rama attend before he built a bridge across the sea to Lanka?" This may seem like simple Periyarist reasoning, but it borrows heavily from a differing civilizational world view. The plebeian, proletariat and non-Vedic deities down south, which are functional (they are supposed to cure specific ailments), and in the thousands, have a greater sway over the masses than the two gods, Rama and Krishna, that the BJP packages as part of its Hindutva ideology. This makes it difficult for the saffron party to communally polarize the south, like it can in Uttar Pradesh and elsewhere in the Hindi belt. During the Karnataka assembly polls, Rahul Gandhi went to some plebeian shrines like Huligemma and Yellamma, but didn’t do enough to register it as an alternate approach. Leaders like KCR or Gowda or Kumaraswamy are very ritualistic, they go to temples all the time, they indulge in special prayers and havans for days, and harp on the astrologically auspicious hour, but yet, what they practise is not Hindutva. They are culturally Hindus who are comfortable wearing a skull cap for Iftaar parties, forming alliance with Muslim parties, and offering the minorities a secular alternative to the Congress. The BJP has never been able to typify any of these regional stalwarts as “anti-Hindu", like they do with Congress leaders. Even when the Sabarimala controversy erupted in Kerala, the BJP read it like a Hindu versus the rest issue, and treated it with a polarizing intent. But, it was not a religious clash. It was an argument with faith, tradition on one side, versus the law on the other. Many liberals too voted in favour of faith and the Congress took that position as well, while the Left went with the Supreme Court’s order that allowed women of menstruating age to enter the temple. Rolling our attention to dynasties, the south’s attitude is slightly different. There are far bigger and more blatant than non-Congress dynasties elsewhere, and the rhetoric about it changes from election to election. While in 2019, we spot no negative sentiment about the Karunanidhi clan in Tamil Nadu like there was after 2009, but there certainly is a whisper about KCR family’s hold over the TRS. Then, there is a slightly louder whisper against Naidu and his son controlling the TDP. There is an open challenge to Gowda’s Janata Dal (Secular) for fielding his two grandsons from Mandya and Hassan. The Gowda family now has two sons, two daughters-in-law and two grandsons in active politics. When I spoke to Prajwal Revanna, Gowda’s grandson, contesting from his grandfather’s traditional seat of Hassan, he kept repeating: “I am not a novice in the party. I have earned my seat by working for eight years." If one spots the pattern over the years correctly, for the Gowda clan this may get normalized with one defeat or one election. The other southern clans may get into a flux the next time around, before a new rationale settles them back in the saddle. The dynastic charge against the regional parties has never been a sustained grouse, like it has been with the Congress. The other thing that needs discussion has to do with film stars. Although it appears a good number of them are successful, that trend may have passed a decade ago. There can no longer be cults like the one an MGR or an NTR or a Jayalalitha built. They rode on regional and linguistic pride in combination with a shrewd welfare agenda and diligent caste management. But in the recent past, one saw that Chiranjeevi couldn’t establish himself firmly despite the stardom. His brother Pawan Kalyan has swung from the Right in 2014 to the Left in 2019 to create the Jana Sena, but is unlikely to win. Similarly, Vijayakanth of Desiya Murpokku Dravida Kazhagam has lost steam, Kamal Hasan is groping in the dark, and Rajinikanth is as indecisive as ever. Summing up the argument on diversity, Kerala is the smallest in the region, but politically the most diverse. To understand this point, you just need to look at the number of political parties in the United Democratic Front (UDF) and Left Democratic Front (LDF) groups. While UDF is a six-party alliance, LDF is a 14-party alliance. It would also be interesting to count the number of Kerala Congress splinters. At last count it was seven. Therefore, the south deploys its cultural and political diversity to resist the BJP. The party of one god, one nation, one religion, and one language finds this very confounding. Sugata Srinivasaraju is a senior journalist and author.